The reef covers a large area at the centre of the Island, was formerly covered by sea as the name suggests, is used principally by the H.I.A. and is used as common grazing by crofters at various points in the year. In the days of "The Currier", Donald Lamont of Ruaig, the area was used for the Tiree Sports and there was in the past an 18 hole golf course on the Reef. The Annual Tiree Association Sports are now held on the school playing fields at Cornaig. Above Crossapol beach, Traigh Bhaigh, the southern boundary of the Reef, there is a small artificial mount which in lore is the grave of Lord Ullins daughter, her body was reputedly washed ashore on the beach after she had eloped with an unsuitable suitor. There is another theory that it may have been the site of a votary cross. I personally prefer the first, more romantic, notion. Crossapol today is the home of the Tiree Business Centre, Manager John Brady, which hosts Argyll College. Here students may video conference with Argyll College in their distance learning scheme. 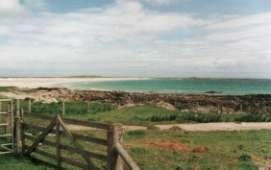 The Business Centre also co-ordinates and gives information regarding the availability of Self Catering properties on the Island which are privately rented and is the home of Marketing Tiree, a community venture. The Island bi-weekly newspaper, An Tirisdeach, is also compiled in the Centre. MacLeods, is the only shop on the Island which sells newspapers, these arrive on the daily, except Sunday, flight from Glasgow and may be collected approximately twenty minutes after the 'plane has landed. Sunday papers arrive on a Monday.